A highly integrated fit-out deserves a high class Lighting Control System. Dynalite Lighting Control. 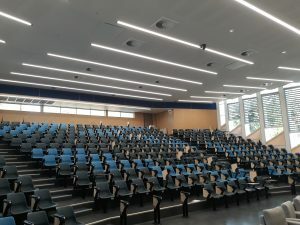 With 27 sensors, 2 keypads, DALI controller, 16 Relay channels a Touch screen, Web interface for scheduling and an AV interface, this theater allows full integration and lighting control from the Audio Visual control system. When not in use the system programming takes care of energy management with daylight harvesting and end of day timers programmed into the Envision Gateway.